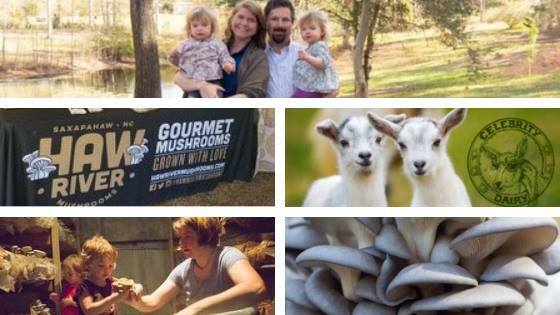 Join these two farms for the Third Annual Wellness Dinner, Sunday January 20 (from 1:30 pm to 5 pm) focuses on the health benefit of mushrooms with Special Guests, Ches & Laura Stewart from Haw River Mushrooms, LLC. Haw River Mushrooms is an amazing local farm specializing in edible and medicinal mushrooms on their small farm in Saxapahaw, NC. They grow primarily indoors with varieties such as oyster mushrooms, lions mane, and shiitake and also often offer piopinni, reishi, king trumpet and others. They do have out outdoor varieties such as; for King Stropharia, chicken of the woods, and log grown lions mane, blue oyster, and shiitake Laura also holds a Wild Mushroom Food Safety Certification, allowing her to sell 19 varieties of seasonal foraged mushrooms. Call 919-742-5176 for more information or email (theinn@celebritydairy.com). 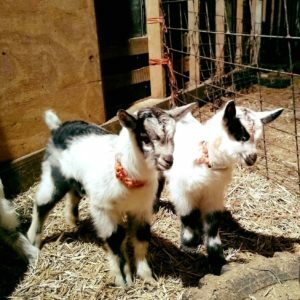 It’s baby goat season again! Join Celebrity Dairy for lots of cuddles and adorable antics, baby goat yoga, and a chance to see a goat dairy in action. There might be new babies born during the Open Barn! Join the farmers for a homemade lunch of soup and sandwiches at the Inn, including many vegetarian and gluten-free options. Finish off your meal with something sweet — including cookies, fudge, and goat milk gelato for sale! Not enough entertainment for you? Browse handmade crafts from local vendors or take a walk around the pond! Advance $10/car plus Eventbrite fee. Day-of admission is cash-only at the Open Barns. A portion of proceeds go to support the good work of Heifer International. The rest of the proceeds support the goats!